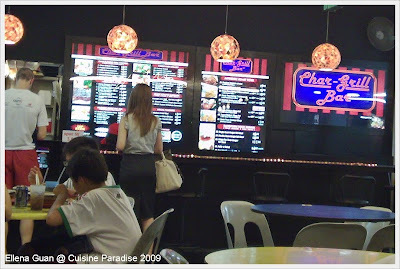 Saw some good reviews from some food bloggers site about this Western Stall in one of the coffee shop at Yishun Ave 11. And after taking a close look at the address, I realised that it is actually near-by to our Church cell-group venue. So today before dropping mum to the cell-group class, we decided to try out the food in this stall. The stall has indeed a nice fast-food style menu with pretty lights and a bar counter with tall seats. 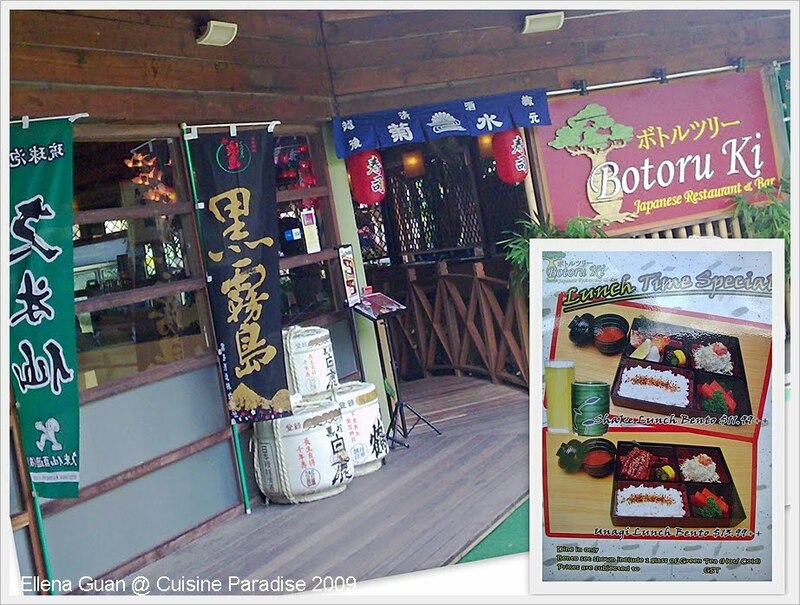 They have many variety of food too, from different types of meat like chicken, beef and lamb to fish and even pastas. Other than food, they also serve alcoholic beverages like Long Island Ice Tea and the stall is open till 3am on weekends. For the start, we try their soup of the day which is the Cream of Mushroom that comes together with the set meal that we have ordered. The taste of the soup is ok, cannot expected too much from a coffee shop stall, but then at least it is not salty and it still taste good. 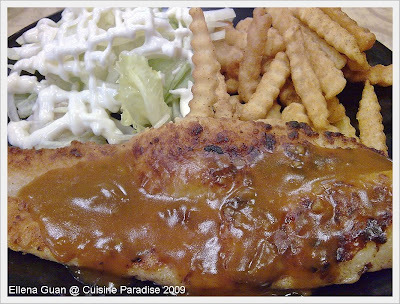 This is the Grill Fish Italian Herbs which come with a huge serving of Dory Fish Fillet, Salad and Cut-in Fries at the price of S$5.80 per set. You can choose any two side dishes with the main course from raisin rice, fries, salad, baked potato, pasta and etc. 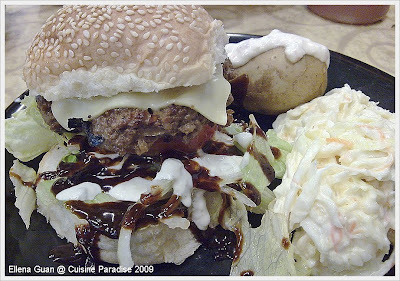 Other than the fish fillet, we also ordered the Single Rock Burger Set, which come with coleslaw and baked potato. The Single Rock come with a piece of Handmade Beef patty that is sandwich before the burger bread and top with their special sauce. While dinning at the coffee shop, at the place where we were seated which is just directly from the stall. We can see that most of the tables were fill with either the Italian grill fish or steak. So I guess these must be the popular dishes of the stall. 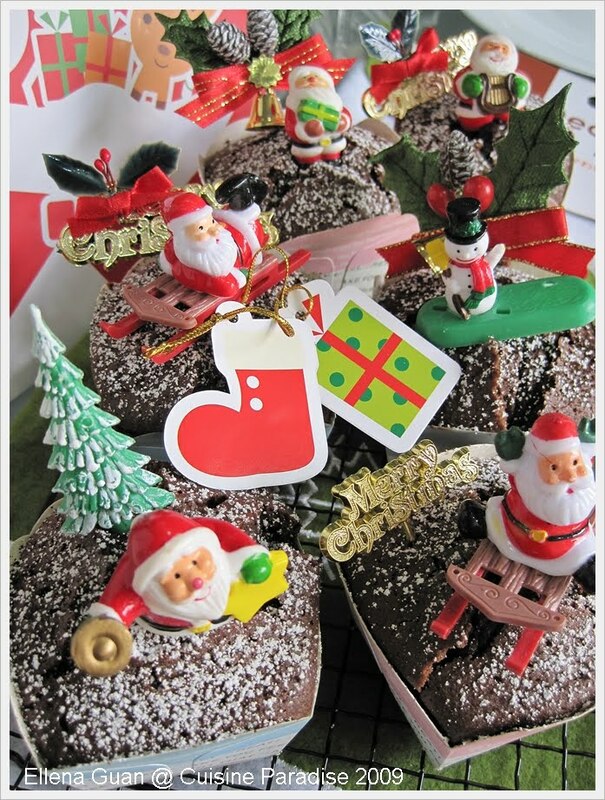 Usually around mid of November onwards, you will be to find all kind of Christmas Goodies on sale at most pastry shop and shopping mall. Eg. Christmas Logcake, Gingerbread man/house, Minced Pie and etc...... Since now is the festive baking season, Rey and I have come up with these quick and easy Christmas Chocolate Cupcakes. After which we gave them a make-over, packed them in gift-bags and ready to distribute out. The Main ingredients for this Chocolate Cupcakes are Dark Chocolate, Egg, Sugar and Butter. 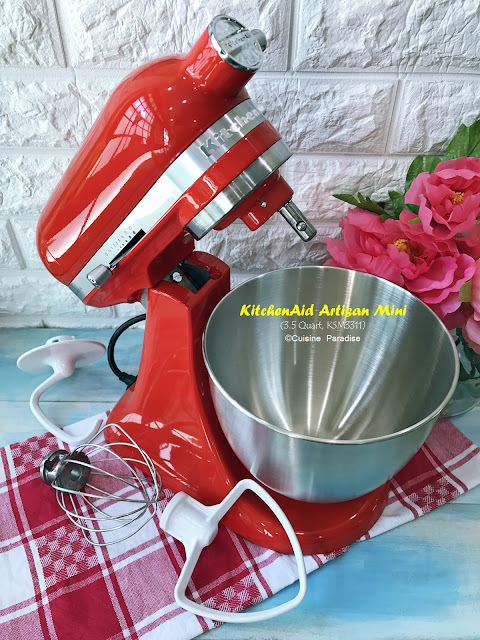 You may also wish to get your kids to be involved in the stirring, mixing as well as the decoration of Christmas Ornaments on the end products. 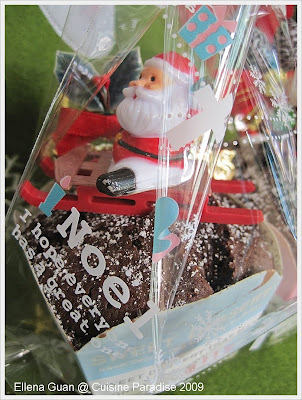 Since afterall, Christmas is a family festive season where everyone is encourage to be involved in the preparation. These cupcakes are so rich and simple to make that you won't hesitate to make another batch in anytime of the week. 1. Set a medium glass bowl over a pan of gently simmering water, melt the chocolate and butter together(refer to the picture above, 2nd row, 1st picture), stir well till everything is completely melted then set a side to cool a little. 2. Sieves the self-raising flour and 1 teaspoon of cocoa powder together and set aside. 3. Beat the eggs and sugar in a large bowl until pale and thick, fold in the flour mixture into the egg mixture till combined. 4. Next slowly add in the melted chocolate mixture and stir till well blended. 6. The cupcakes will be soft and gooey in texture and appearance. 7. 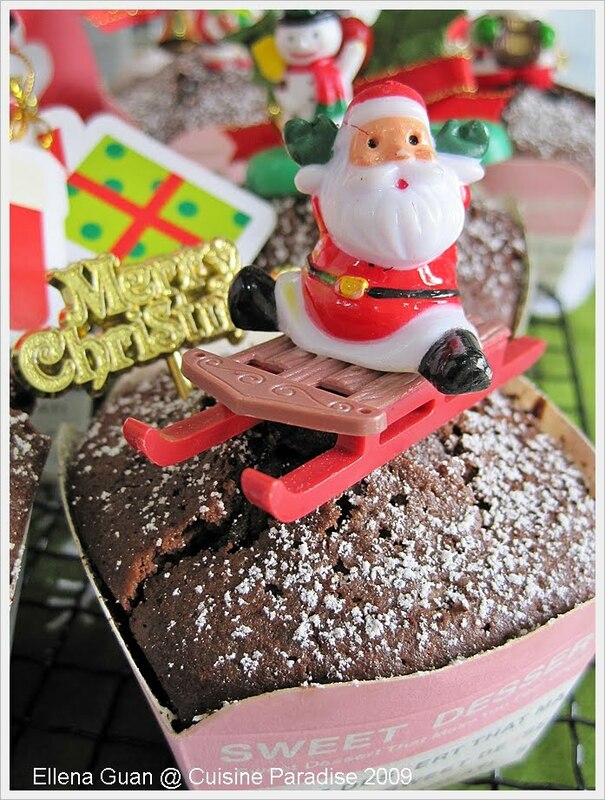 Remove from the oven and cool for 5 minutes, dusted with extra cocoa powder and icing sugar to create the snow effect. 8. Lastly decorate it with some store bought Christmas Ornaments for that extra festive outlook. 1) The cupcake case that is used in this recipe yield 150ml of mixture per case at 3/4 full. 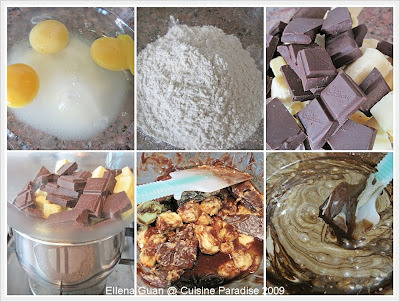 2) If you prefer not to have that gooey texture cake, you can baked for another further 2 - 3 minutes for dryer texture. After the baking, dusting of icing sugar, placing of Christmas decoration, it is time for gift wrapping. 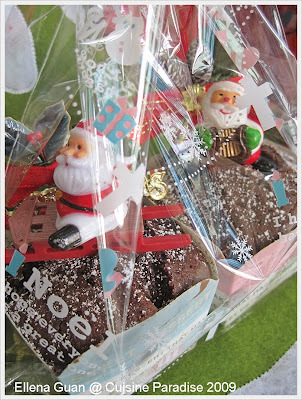 You can get some fancy wrapping bags and ribbons from Daiso or any leading Baking Accessories shop like Phoon Huat (Singapore) and Bake It Yourself. I am sure anyone will feel great and heart-warming to receive such a wonderful homemade gift. So if you can bake any simple cookies or cupcakes, why not grab some nice wrapping bag and start making your very own Christmas goodies for your love one, colleagues or relatives. I believed they will be surprised and delighted by your special thoughts and bakes. 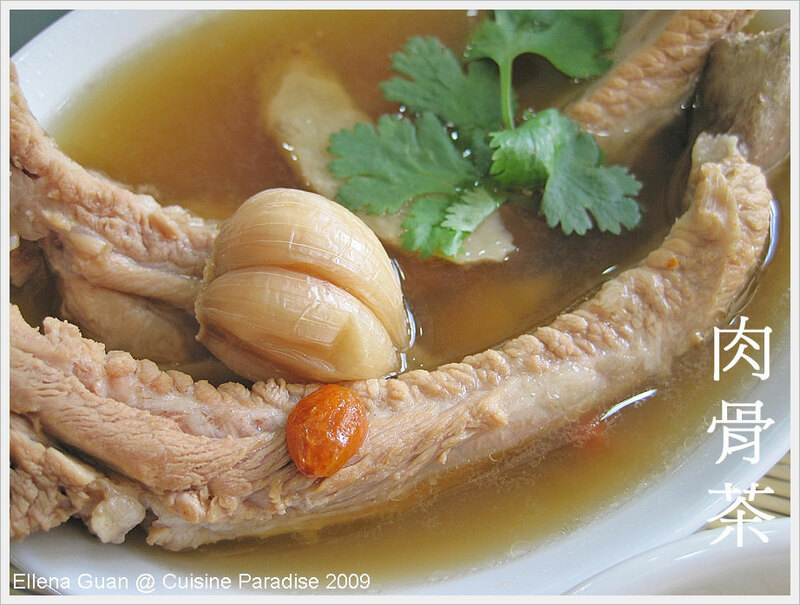 Bak Kuet Teh is one of the popular Chinese soup found in Asia countries, such as Malaysia, Singapore, Taiwan and etc. In Singapore there are mainly 3 different types of Bak Kuet Teh and the Teochew version is more popular with patrons with its light color soup base that is more pepper in taste. Whereas for the Hokkien who prefer stronger taste soy sauce is added which results a darker soup. But as for Cantonese extra Chinese herbs, gingok nuts and etc are added to create a stronger flavoured soup. 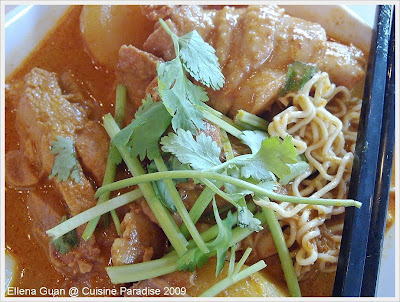 The famous Sarawak "Jia Xiang Mee" has about more than 6 outlets scattered in different area of Singapore. 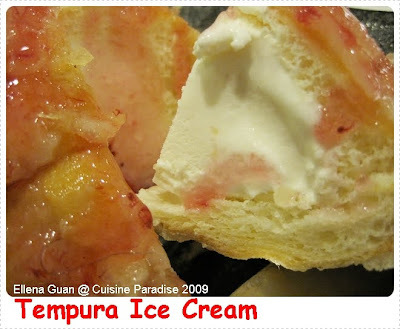 Till now, we have tried about 3 times in their Vivo City, Compass Point and Thomson branch. According to the menu and write up, their noodle is Air-Flown fresh from Sarawak Kuching and their wanton skin is thin and smooth. 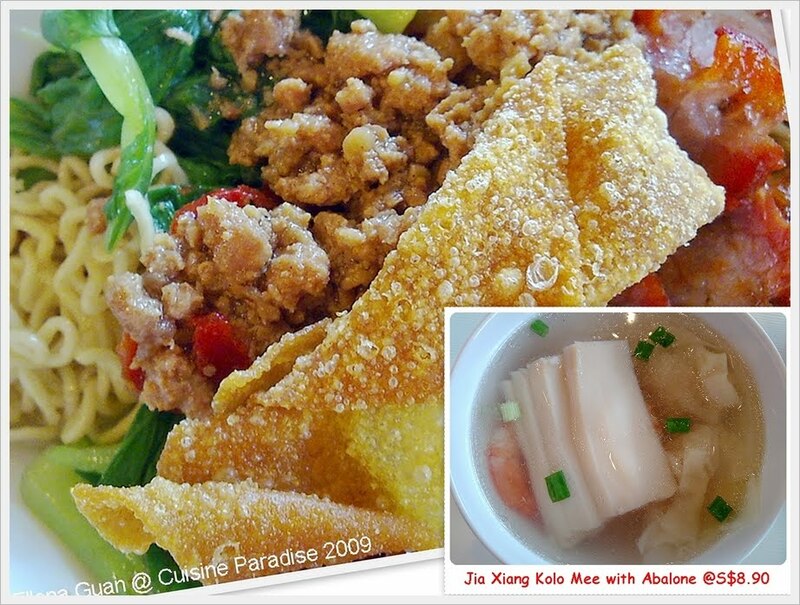 They have different choices of dried Kolo Mee such as Abalone, prawns, wanton and etc. 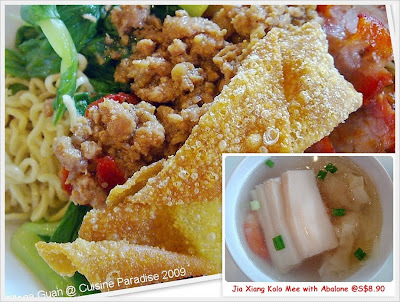 The photo feature here is their Signature Dish of Kolo Mee with Abalone slices. Friendly speaking, you can ask for more when you pay for a bowl of noodle at S$8.90. But we are just curious on what kind of Abalone they will be using.... and I guess from the photo you can see whether is it worth to pay the S$8.90 :p Other than the so called "Abalone slices", there were plenty of ingredients such as - lots of green vegetables, minced pork, char siew, fried wanton and in the separate bowl of soup there are 2 prawns and 3 wantons. Em... for me as I was in a mood of having curry, I decided to give their curry noodle a try. I have tried a few curry noodles from those famous stalls selling Chicken Curry Noodles but the curry at Jia Xiang taste much different from the local type. I personally find that the curry don't really goes well with the Kolo mee as it taste a bit blend or maybe the noodles has not adsorb the gravy from the curry. There is also a powdery taste in their curry gravy so I guess is not my cup of tea. 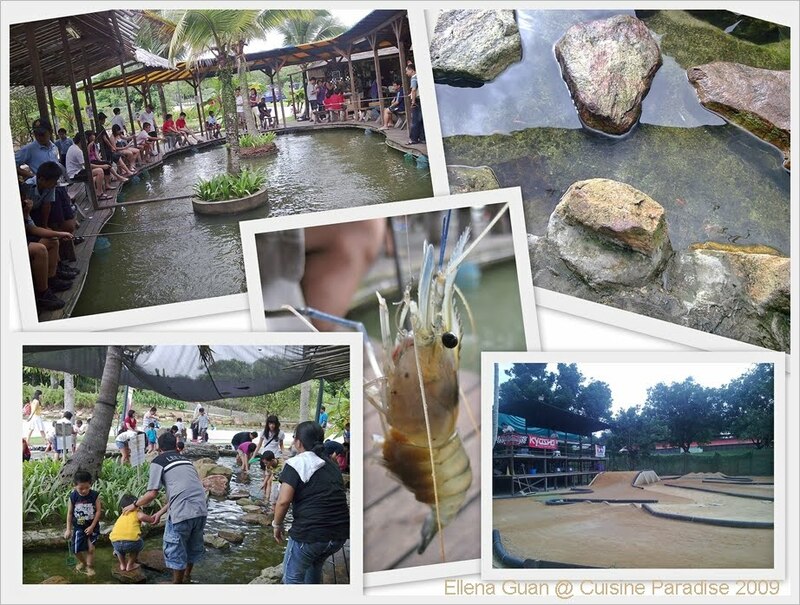 Prawning has became one of the hottest past-time hobbies for most Singaporean from young to old. No matter which age group you belong to, this is indeed a fun, patience testing, friends and family get together type of activities. Last weekend, we visited Bottle Tree Park which is a walking distance from MRT and bus-stop. 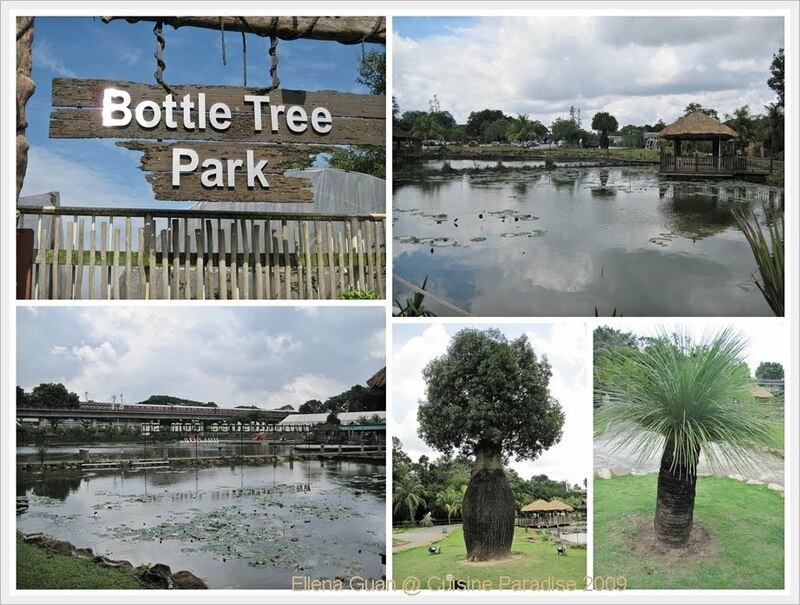 We have being to the Bottle Tree Park a few times which is about 5 -8 minutes walk away from the Khatib MRT Station(NS 14) station. This is a concept village where there are different kinds of sports, recreational facilities, conference rooms, eateries as well as old-times nature. After about two years since it's grand opening in 2006. This park has being doing well and they have in-corporate a new Japanese restaurant called "Botoru Ki" which serves many varieties of reasonable price-range Japaneses Bento set meals. 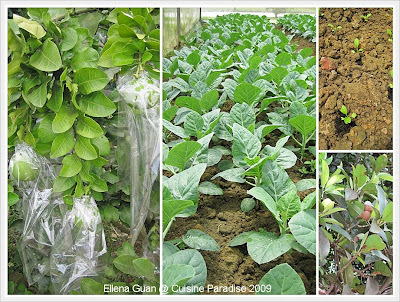 They also have this little "Vegetable Farm" near the entrance of the Park where they cater for Schools Educational Tour. These are what I have discovered while discovering around the park. Neat rows of seedlings and vegetable are being planted at different stage for school tour and they even have this little cafe that looks like those western farm-style cafe that sells they own-grown vegetable, homemade snacks and beverages. Behind the vegetable patch, there is a narrow path-way that consists of different cages that which you can see Chicken, Rabbit, Goose, Quail and etc. 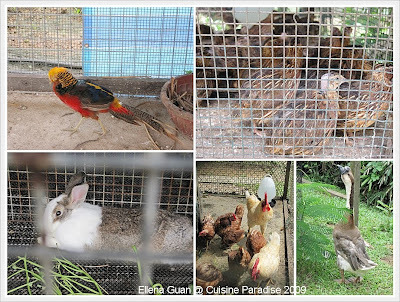 This is indeed a great discovery where young kids can take a look on the Kampong life-style as well as the local farm animals. In this park, almost every members of the family can be occupied with certain activities that they like. They can choose from Long Kang” (drain) Fishing, Prawning, Paintball, Swan Paddling, Outdoor Courts (for playing balls)Remote-Control Car Racing and etc. 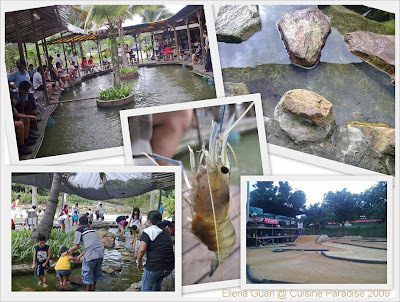 Prawning is a great activity where families and friends can have great time together. The anticipation of prawn biting, the patience of waiting, the excitement of hooking up a prawn and the reward of a great feast of fresh prawn. All these are wonderful moments will be last in the memories. 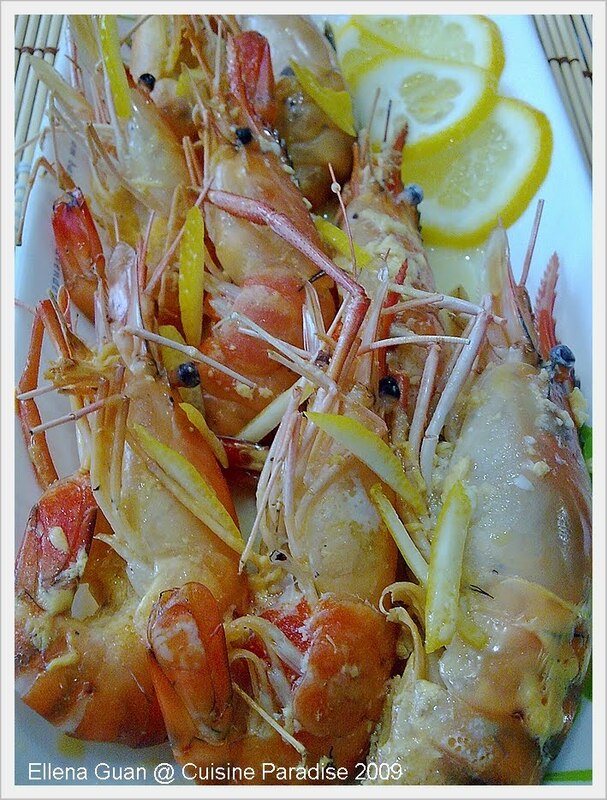 This is our victory of the day..... after waiting patience for about 3 hours at the pond, we managed to grab some decent amount of Fresh Prawn to whip up this wonderful Baked Prawn With Lemon & Cheese. If you are interested with the recipe, you can hope over to my recipe blog HERE to read more about it. These baked Lemon & Cheese Prawns are from the Fresh Live Prawn that we caught during our Prawning Trip last weekend at Bottle Tree Park. 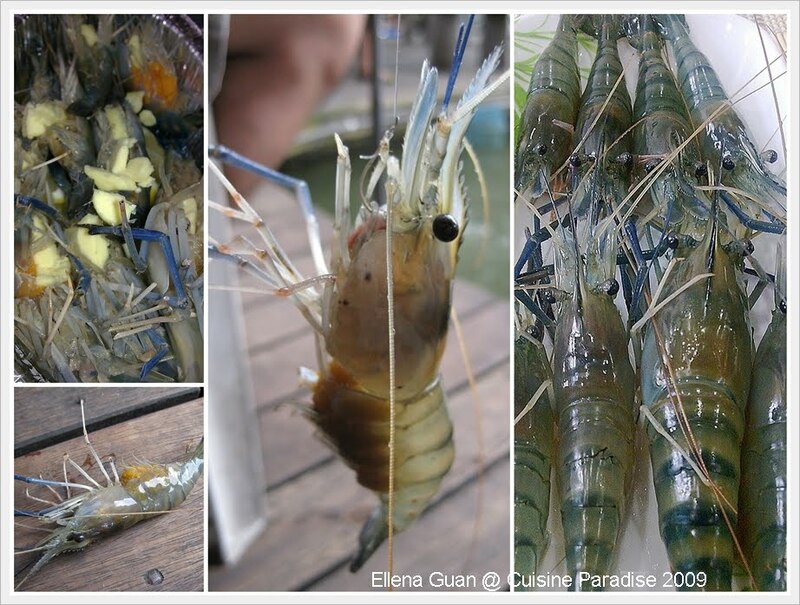 It is indeed an enjoyable experience on the prawning trip and most of thrilling part is I get to use these prawns for my new dish. This is a very simple dish that most of you will be able to grab the ingredients right from your fridge at any moment. All you need are some butter, 1 lemon, 2 slices of sandwich cheese if you are run out of shredded cheese. 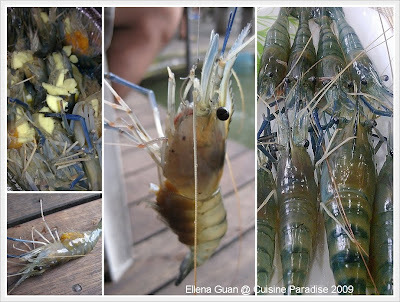 Don't worry if you don't have Fresh live prawn, you can always get any type of prawns from the supermarket or you can even replace it with fish fillet like salmon or any white fish. 1. Wash, trim and slit the back of the prawn into half, becareful not to cut too deep or else the prawn will break into halves. 2. Cut the butter into small cubes and stuff it into cuts of the prawn. 3. 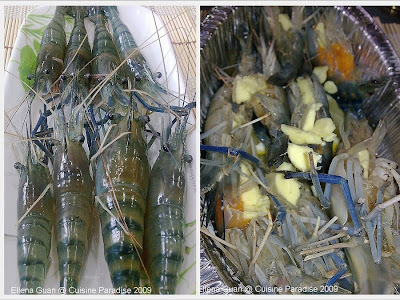 Arrange some lemon slices in a baking dish (or you can use disposal foil baking tray), place the stuffs prawn on top of the lemon. 4. 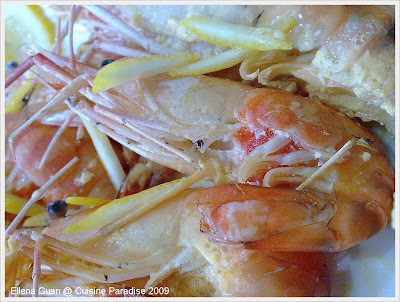 Top the shredded cheese on top of the prawns, drizzle the liquor evenly on top of the prawn. 5. If you want that extra citric fragrance on the baked prawn, you can top with some extra strips of lemon rind. 6. 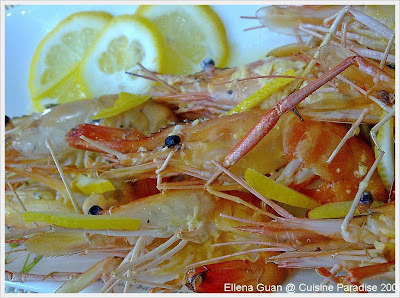 Bake in the toaster oven for about 10 - 15 minutes or until the prawn is cook through. 6. You can serve this dish directly from the baking tray or you can re-arrange them in serving plate and serve as finger food for party. 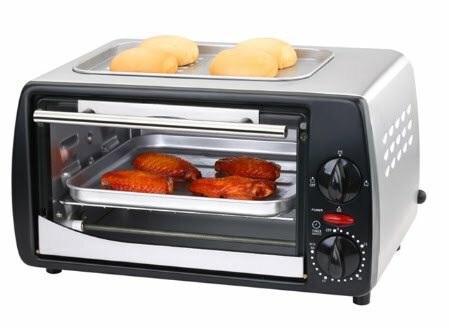 ~ Above is the sample photo of the toaster oven which you might have it in kitchen, it is usually used to reheat bread, pizza or small items. The gravy of this dish is so fragrance and sweet due to the sweetness that comes from the fresh prawn. Look at the prawns, some of it still comes with prawn roes. The combination of Lemon, Cheese, Prawn and Liquor will definitely stimulate your tastebuds to another level of food tasting. A bowl of warm and hearty soup is always a great comfort food for rainy season like these few weeks. After a long day at work, having a bowl of homecook soup is always such a blessing in life. For me, I am very particular about soup and I must have soup at least thrice a week. 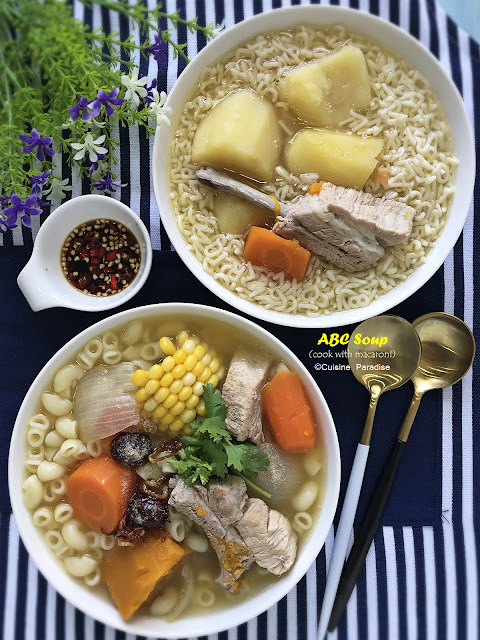 I believed a bowl of homecook soup consists of all kind of nourtition and will helps strengthen our body and prevent diseases as well as common sickness. 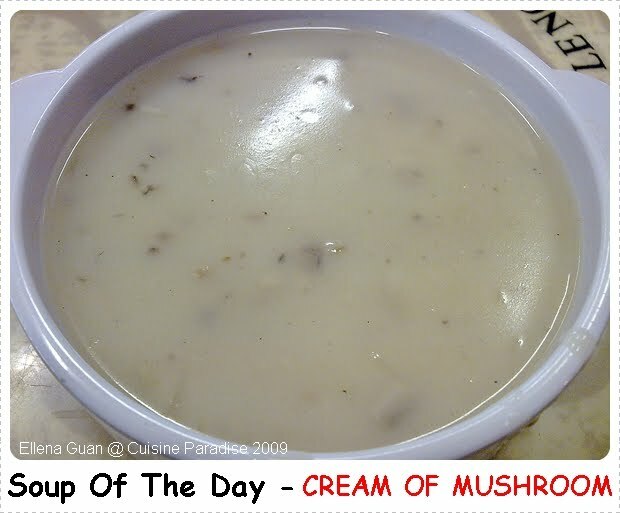 Soups can be made in different ways such as double-steamed(double-boiled), slow boiled and quick boiled. 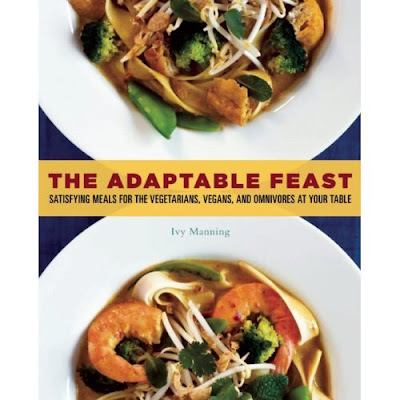 In this modern society, most of the households are equipped with more advance availability of alternative cooking utensils that can shorten the cooking process but yet retain its natural flavour. Like I have used to share in most of my "Soup Posts", Red Dates and Wolfberries are some very common Chinese Herbs ingredients that can be added to our daily soup as part of the ingredients for flavouring. 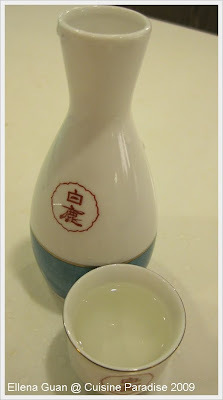 Today's main ingredient is "Huai Shan - 淮山" or sometime which is also refer to as "Shan Yao - 山药". 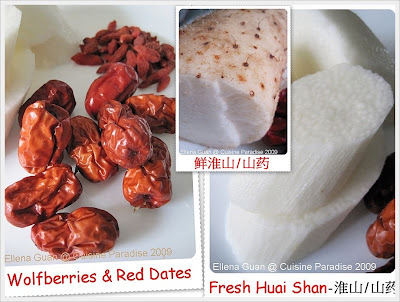 Fresh Huai Shan is mostly sold in supermarkets or wet markets which you might not recognise the fresh Huai Shan as the appearance looks very different from the dried type that are thinly slices and harden before packing. The fresh one will be found in long stick-like root form with skin intact. After peeling the outer skin, you will find it wet and excessively slimy. But don't worry, the sticky substances will disappear once it is boiled in water. 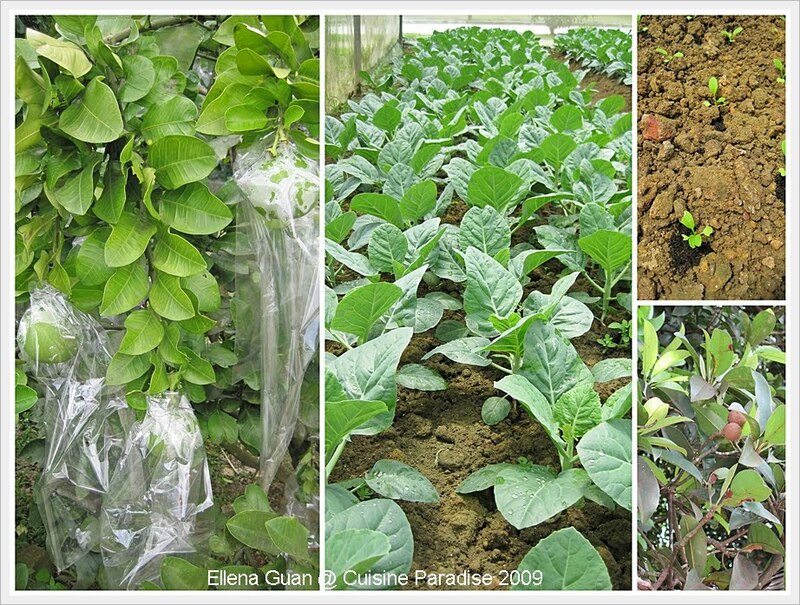 Fresh Huai Shan is nature and sweet in taste that is similar to sweet potato or potato texture when used as a soup ingredient. It benefits the Spleen, Lungs and the Kidneys and strength the health. 1. Wash, trim and blanched the chicken in boiling water for about 3 - 5 minutes, rinse with tap water and set aside. 3. Bring the pot of water to boil, add in all the ingredients, except the wolfberries, when the water come to boil again, let the mixture simmer for about 5 minutes on low heat. 5. Season with salt and serve with rice or you can use it as a soup base for noodles. I was so shock and thrill to receive an email from Food Blogroll last Sunday, 14 November 09 informing me that my blog was selected as this week's winners for the Foodie Blogroll "Adaptable Feast Cookbook" giveaway! It has being really a long long time since my last baking on Macaron. 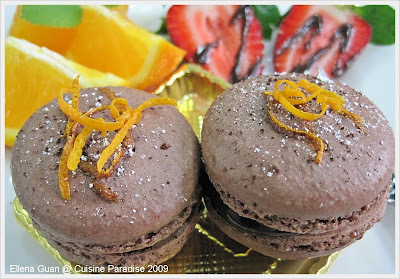 I remember during year 2007, when Macaron started to be a "HOT" items on most leading cafe, a lot of food blogger or bakers started to experience on baking these "little gems". 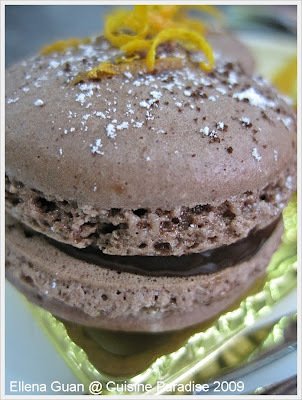 I was also one of those home baker who venture out into different flavour of Macarons (click HERE to read more) baking. Today's flavour is a combination of Chocolate and Orange. Since my little darling requested for a Cocoa Shell, I used the Dutch Process Cocoa Powder which I got it from "Shermay Cooking School" from one of my friend who is working there. And since she wanted to make some Macaron and ask me for an easy recipe to follow, I decided to try my luck on making this "Gem" again after the years. And Thank God, this recipe still works well and the end products is still as lovely as before. I was still quite nervous during the process of whisking the egg white and mixing of flour mixture. When the piped batter is ready to go into the oven, I was even more excited and I standby near the oven door to look at the "Feet" raising up slowly which really makes me so happy about it. I guess the process of making Macaron is to make sure that they have a nice "Feet" and most important the shell does not crack or sink. 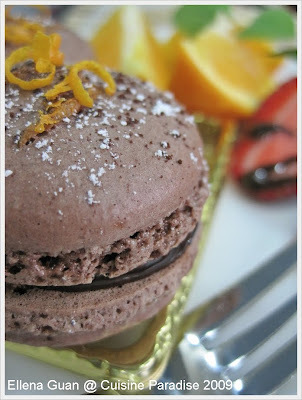 So overall I am very satisfy with this "Orange Cocoa Macaron" which sandwich with Orange scented Chocolate Ganache. As requested by some of the readers who wants to try making their own macarons, you can refer to this link HERE. 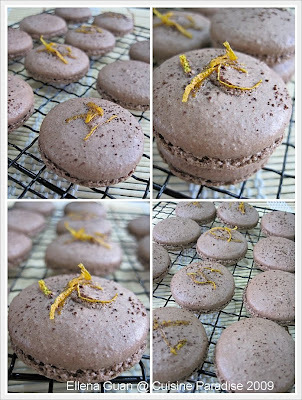 The blog author, Tartelette has a wide range of macarons recipes with great explanation on how to make the shell as well as the filling. I am sure those who are interested in this will be able to find some inspiration and help on making these beautiful gems. 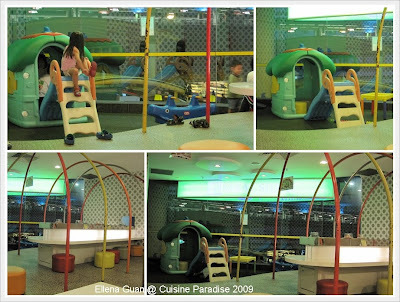 Sakae Sushi at Sembawang, Sun Plaza Shopping mall is one the revamp outlet whereby they have this kids' corner which is like a small playground for kids to hang around while the parents can enjoy their meal and at the same time supervise their kids at a visible distance. Other than the kids' playground, this outlet also have a little conveyor belt corner especially cater for kids to enjoy their version of kids' sushi and bento. As usual, we have to settle the kid first before our meal. Rey will always request for his favourite Tamago Nigiri to go with Ebi Tempura. 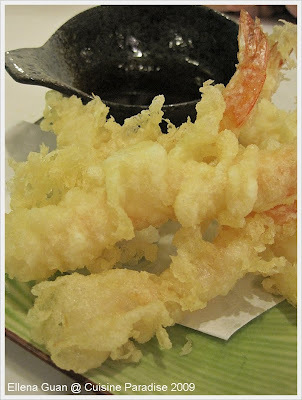 And Ebi is the only item that he likes to eat as a finger food during our visit to Sakae. But sometime, he will reject this if the prawns are over-fried or the crumbs have soften by the time this dish is served to us. 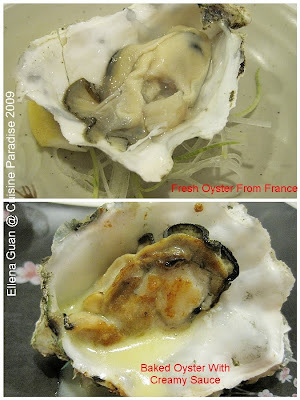 From their promotion pamphlet on the weekend Teppanyaki, whenever you order any set menu, you are entitled to purchase 1 Fresh Oyster which is direct air-flown from France at a special price of S$1.50 each. So with this great deal,on hand, we decided to get two. One which is raw while the other I choose to have it grill with white sauce. But whichever method it served, both are great for it's taste. We ordered the special promotion on Boston Lobster Set for 2 which comes with these following dishes as well as salad, rice and miso soup. 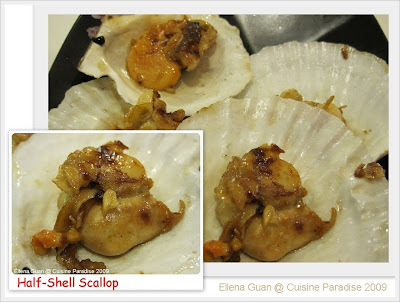 The first side-dish to set on the table is this 4 Half-shell Scallops that are cooked with special sauce and minced garlic. 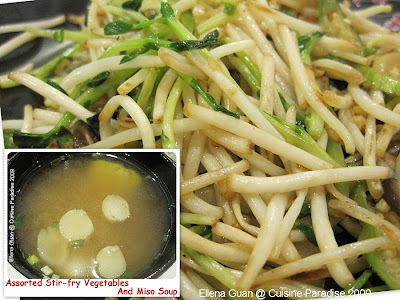 A plate of Assorted Stir-fry Vegetables which consists of mushroom, assorted beansprouts, onion and minced garlic. We love the crunchiness of this stir-fry vegetable which is fresh and not over-cooked. 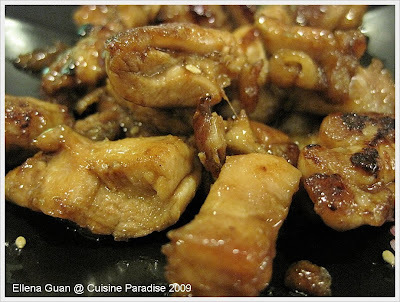 I am not sure how they prepared this chicken dishes, to me it taste sweet and somehow rather like honey chicken or maybe grill chicken pieces with Teriyaki Sauce. But this is another dish that goes well with their Japanese short-grain rice and miso soup. Here comes the STAR of tonight's dish which is the Boston Lobster. The chef divides the lobster into a 3 different parts and served it in different cooking methods. First to be served on the table is these two huge Lobster Claws which they thoughtful crack the hard shell into easier breakable parts that allows us to eat the meat easily. I must confess that even at the claws part, the meat is sweet and tender. 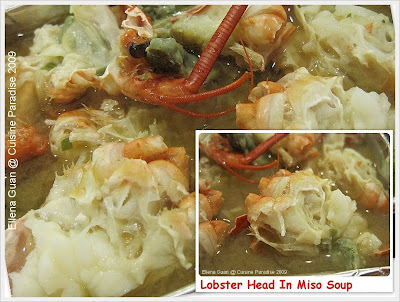 The Lobster head is chop into smaller portion and simmered in an aluminum foil to cook into a savoury Lobster broth. 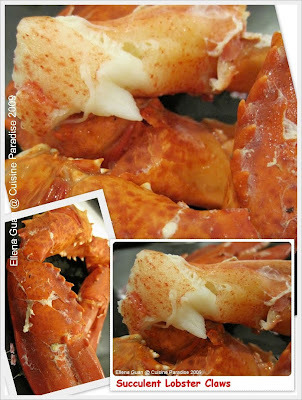 The broth was fragrance and full of flavour and goodness that are released from the sweetness of the lobster meat. 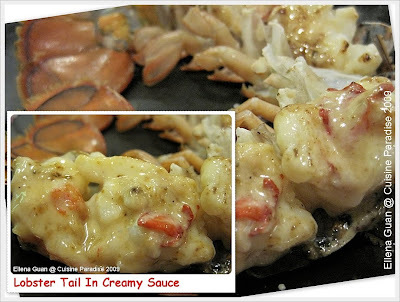 Out of the 3 different cooking method and portion of the Lobster, I guess most of you will aim on this Lobster Tail which is cooked with a kind of creamy sauce that consists of butter, mayonnaise and herbs. The meat is so succulent and each bites is full of satisfactory from the combination of the sauce. Although this set costs around S$49.90, I guess it is still worth the price for the taste of the freshness of this Boston Lobster which you can eat from Head to Tail.